The Interhotel Central Karlovy Vary is located central to the area of the city which is home to the hot springs which make this area such a popular draw. This provider of Karlovy Vary accommodation is also convenient to the town itself and the many attractions to be found therein. The Karlovy Vary International Airport is located to the south of town, not far from the Interhotel Central Karlovy Vary. 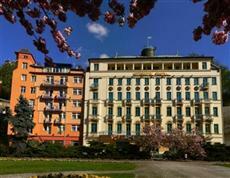 The rooms at the Interhotel Central Karlovy Vary are rated as four-star level accommodations. Each of the rooms includes conveniences such as a television, an in-room safe, a desk and newspaper service. Non-smoking rooms are available among the options. Room service is available around the clock. The Interhotel Central Karlovy Vary provides its guests with access to a host of treatments which address all the various aspects of an individual's health and wellness. More conventional facilities at the hotel include a sauna, a fitness center, a restaurant which serves food in-line with the hotel’s health philosophy and parking for those who arrive in their own vehicles.